Requriments: A capture card, a card with video-in or tv-in. PicVideo MJPEG Codec or best quality Huffyuv codec and VirtualDub. Install PicVideo first Or install the Huffyuv codec for the best quality but requires lots of hd-space, download the pre built-dll and exctract the zip and rightclick on the .inf-file and select Install. Launch your tv-application and select the channel you want to capture from. Exit your tv application. <- This is only for TV-Cards. Launch VirtualDub and select File->Capture AVI and the capture mode will start. To capture from linein,composite or svhs change the source in Virtualdub under Video->Source. View a MJPEG Quality comparison between the settings here. 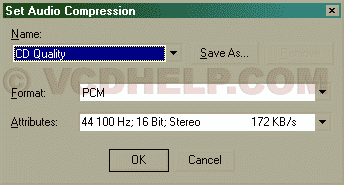 Select Audio->Compression. Select CD Quality for best quality. You can also try to encode directly to mpeg3 or anything. 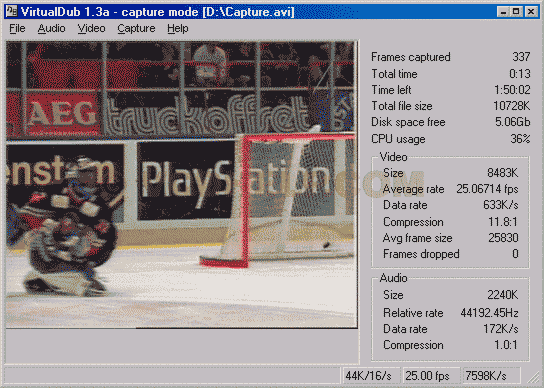 Select Capture->Settings and set Frame rate: to 25 (PAL) or 29,97(NTSC). Select Wait for OK to Capture, Capture Audio and Lock video stream to audio(and the audio will get synced if you drop some frames). Now you are ready to Capture. Select File->Set Capture File and configure where you want to save your avi. Then Select Capture->Capture video. Hit Begin when you want to capture. Check the Frames dropped -> if it increases to much you have too slow computer( be sure that you have selected DMA on the harddrive that you capture to), try then to configure the quality setting under MJPEG Compression setting/HUFFYUV setting. 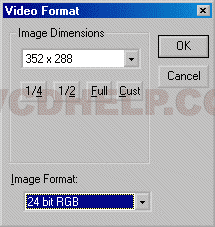 Now convert the capture AVI to VCD, SVCD or DVD MPEG. If it still doesn't work try to restart VirtualDub sometimes. Use Virtualdubs Multisegment/spill system, read here how to use it. Be sure that you have selected DMA on the harddrive that you capture to. Try to use the Huffyuv codec instead, a very god codec but require lots of harddrive space. Select the codec and be sure to select YUY2 under Image Format. I can't select the Video size that I want. If you cant select the correct video size, use the Video-Set Custom Format and set it there instead. And also try to select under Video->Preview if have problem to capture in higher resoulutions. Here can you find some other Video Editors and Video Capture Utilities.